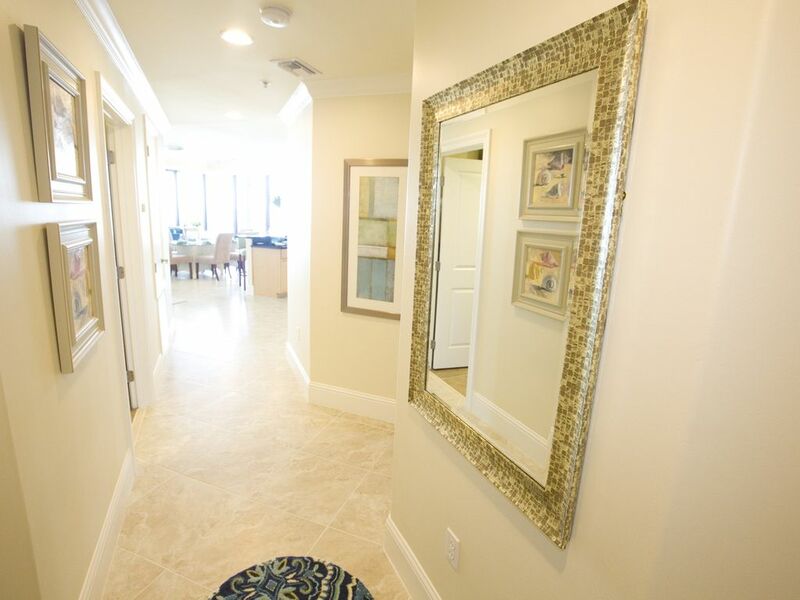 Stunning Seaglass - 3 BR- 3 Bath HUGE Luxury Condo! Discount Rates-Summer 2019! 3 Bedrooms, 3 Bathrooms, Sleeps 6, style & luxury with amazing outdoor space! Floor to ceiling glass allows for beautiful, panoramic views of the tranquil beach on the Gulf of Mexico, in this newly decorated 3 bedroom, 3 bath home. More than 900 feet of outdoor space is perfect for relaxing & enjoying your stay. Fully stocked with everything you need, just bring clothes, food & you are ready for a stress free vacation! We take care of the details. Sleeping for 6, including a King master with on suite bath, includes a Jacuzzi tub, large shower and double vanity with a make-up area. There is a queen bedroom with a full on suite bath, and in the third bedroom, two twins that are comfortable for adults, with a bath just outside the door, completes the sleeping arrangements. All bedrooms have access to outdoor balconies. You are going to love the soothing colors of the sea in this luxurious home! We have fallen in love with this little qaint, tranquil place called Dauphin Island, and are thrilled to get to share our home with others. Come for a visit to the island, spend time in the Bird Sanctuary, tour the Estaurium, see the fort, eat local seafood, watch the sunsets and you may decide to never leave! We live 6 hours away and come as often as we can, and have chose this place to me our second home. We think you will fall in love and will want to make Seaglass your "forever" vacation place! Seeing the massive balconies, the floor to ceiling windows, the soothing colors of sea glass, we knew this was a special place. The corner unit allows viewing of the Gulf of Mexico and the inter- coastal way, a wonderful vantage point to spend the idle, peaceful hours of the day, no matter the season! The interior living space is greater than 1800 square feet with another 900 or so of outdoor balconies, giving you lots of space to spend time with those you care about. From the moment you inter the front door you can see the splendor of the Gulf. And, the next thing you know you are getting to enjoy the beautiful pelicans and bird life, that makes this place so special. And all the amenities of a 5-Star resort are just outside you door! All bath rooms are stocked with an abundance of thick, cotton bath towels, hand towels and bath cloths. There are three full baths, and we supply the body wash, shampoo, bath tissue, Kleenex, and hair dryers. A house phone with free long distance, if you don't want to use your minutes! Cool and comfortable, with a dehumidifier! Nice for the cool months. Comfy is the word! Each bedroom is stock with extra, high quality linens, and layers of covers! All cotton for easy care & cleaning. Easy to use, so you don't travel home with all that dirty laundry! Just throw those wet swim suits in and they are ready for the sun tomorrow. Easy, shady parking on two levels, and open parking on the third level. First & second level is garage parking for keeping your vehicle cool in the summer. With lots of wi-fi access. Bundles of thick cotton bath towels, washcloths and hand towels. We also so stock 8 large beach towels! Oh yes, so no reason to not get your steps in for the day! Easy access from the elevator, and the choice of 3 parking levels. Need to relax, two Lazy-Boy Wing-back chairs & two very comfy sofas! Handy ice maker & water in the door. Always clean and ready for baking! Flex-brew that makes carafes and also K-Cups. We supply the filters. Large 4 slice adjustable for bagels, so no one has to wait for warm toast! I am a cook, so the kitchen is well stocked with Wustof knives, good cutting boards, le Creuset pot, iron skillet, & plenty of pots for your seafood boil. Also, two drawers of spices. Beautiful glass top table that seats 6 comfortably, with 4 barstools. All bedrooms have TV's, with a SMART TV in the living area for viewing Hulu, Netflix.......your choice!. Currently DISH with plenty of movie and music channels. Beach toys are in the closet, so you don't have to pack or buy! Also, we have 4 beach chairs, and an umbrella for enjoying your beach day! Enough outdoor balconies to host a marching band! Kayak, canoes, and jet ski available for rent on the island. Bike racks on the property with bike rentals available on the island. Located on the 3rd level of the complex. Also, marked for Pickle Ball! A small 9 hole course is located on the island. Actually there are two pools, one outside and the one inside is heated during the cooler months. Dauphin Island is a Bird Sanctuary , that was first mapped in the 1500's. So it is a history and a nature lover's delight. It is called the Sunset Capital of Alabama for a reason! Do come see for yourself! You are going to want to make this your "forever vacation home"!! Great corner condo with views of ocean and sunset. Hosts were very gracious and made sure everything was great. Would visit again! Thanks Chris, and so pleased that your family enjoyed your stay! We too, love enjoying the views of the "sunset capital of Alabama", from the spacious balconies! We think it's the best spot on the island. We look forward to having you and your family back soon! This is truly an amazing place! The condo was very well stocked, clean, and the views are out of this world! We have rented from Sandy several times and she is awesome to deal with. You can't go wrong with this one! Thank you so very much for the kind comments! As you know we do keep the place well stocked and ready for you when you come in without any guess work about needed supplies! And we work hard to keep our home, clean and looking like brand new! It was our blessing to have you and your family back, especially for a Christmas vacation! Do come back soon! Awesome Beach Front Condo for Thanksgiving! We have visited a couple times now, and we love Dauphin Island and the Sea Glass property. Visiting in either the summer or the winter is a win for our family. The condo is comfortable and accommodates all of our needs. We look forward to coming back soon! The most comfortable, well stocked and beautiful place on the Gulf! We try to have everything stocked so that you don't have to guess about what to pack or purchase! Hopefully making your vacation stress free! I have stayed at this location many times and Seaglass is. The absolute best! You cannot find a better place to call Home on the island! We’re so impressed! We had an awesome time! Views from all over the condo, and especially from the wrap around balcony, were stunning! The kitchen was fully stocked- we ate in every night and sat outside (easy clean up for our ten month old who drops a good bit of food on the floor). The master bed was comfy and our twins loved their matching beds! I thought given the time of year, the building would be more crowded but rarely had to wait more than a few minutes for the elevator. We also got to see a rainbow and mess with a crab on a few AM beach walks! I didn’t mind my ten month old crawling around the floor- the ultimate test in cleanliness! Would definitely book again- thanks Sandy!! We are blessed with a wonderful Housekeeping team, that do a tremendous job of helping us keep everything extremely clean! It is our second home and that is the way we like it and want it to be that way for our guests! We too enjoy the wonderful views from the large balcony, during all seasons. Watching the Gulf & the changing weather is one of our favorite pass times when at Seaglass! So glad your family was comfortable and we do hope you will come again soon!